The Trans* World Today: Community Forum is a discussion not to be missed! This coming Tuesday, November 12, a panel of experts will come together to address the current status of those who identify as transgender, gender queer, transsexual, or other trans* and gender variant identities in the areas of healthcare, employment, civil rights and more. The discussions will offer best practices for creating change around these issues as self-advocates and as allies. This forum is open to the community and is free of charge. ASL interpretating services will be provided. Henry Hinesley, Coordinator of the RIT LGBT Center. 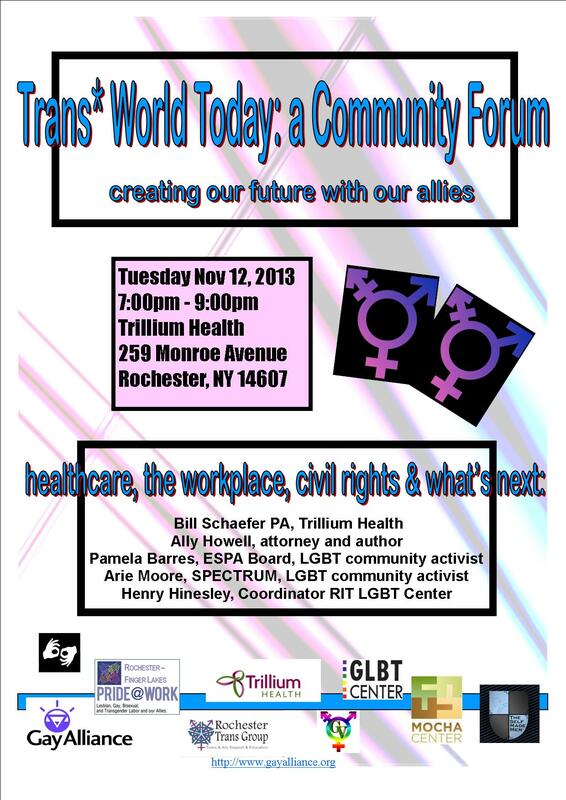 Trans* World Today: A Community Forum will take place on Tuesday November 12 from 7:00-9:00pm at Trillium Health, 259 Monroe Avenue.